Peace, Forward Together! Peace Is the Way, and We Are Peace. 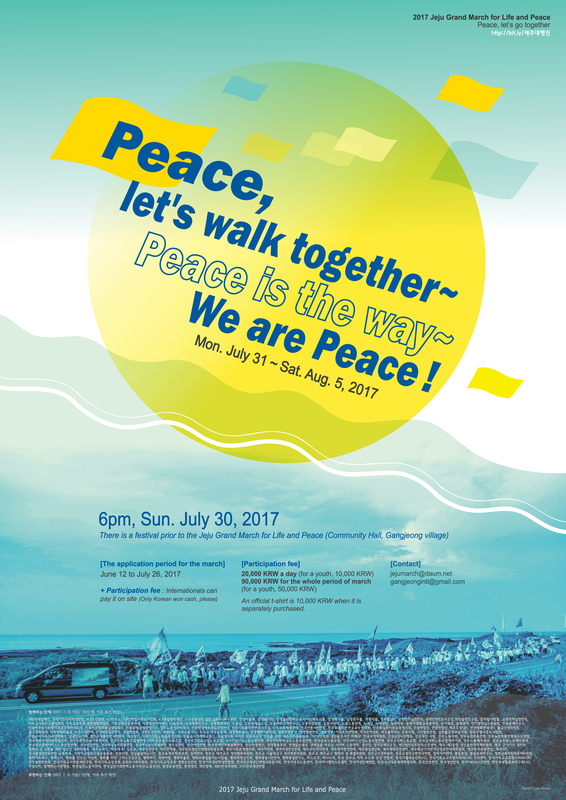 As we pray together for peace in Jeju and peace for all of us., we will march together in Jeju again this year. All participants will start from Gangjeong Village at the beginning and meet at Jeju City at the March’s conclusion. In between, the participants will divide up into two processions, which will each walk around one side of Jeju Island’s perimeter – one group along the eastern half and another group along the western half. 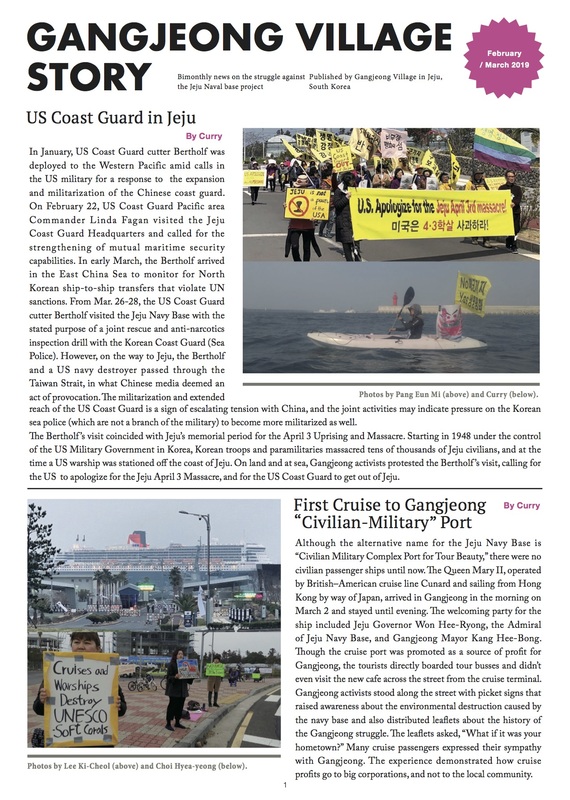 In addition to Gangjeong, the whole of Jeju has been suffering from the remilitarization of the island, including communities that have been struggling against the construction of a second airport. This year we have changed the event’s name to the “Jeju Grand March for Life and Peace” because we are marching to protect peace in all of Jeju. Full – Participation in the entire March: Adult 90,000 KRW, Youth 50,000 KRW. Official T-shirts may be purchased separately – 10,000 won. During the March, housing and meals are included. Participants sleep on the floor on thin foam mats in gymnasiums along the course of the march, but alternative dormitory style housing in Gangjeong is available for international participants. Participants should prepare their own pillows/sheets/sleeping bags as needed. Most of the gymnasiums also have places that participants can pitch their own tents. If you have your own tent, sleeping bag, etc. you can sleep more comfortably. Please bring your own toiletries (tooth paste, tooth brush, shampoo, towel, etc). You might want to bring a raincoat/ poncho just in case. It would also be useful to prepare bug spray and itch cream. On Sunday the 30th before the march and on Saturday the 5th after the march, participants can sleep in Gangjeong ceremonial hall or the peace center, etc. but these places might be very full so participants are encouraged to consider finding separate housing on those days. (International participants can stay the village hall dormitory at this time). If you plan to return to Gangjeong from Jeju City on the night of the 5th, please let the preparation team know so we can prepare. During the march, a truck follows us carrying our baggage. Participants can but their bags in the truck in the morning, and find them again in the evening at the gymnasium where we sleep. Then you don’t need to have a heavy bag while you walk.